It's no joke... I've got another article in Time Out this week. Peter Watts, editor of The Big Smoke, asked me to put together the scottish theme because Gordon Thomson, the magazine's editor, is leaving and this was (is?) his final issue. This issue is a particularly good one, not just because of my contribution, but because in the first 28 pages alone there are lots of interesting things in it including the pieces on the baroque (ooh baroque! 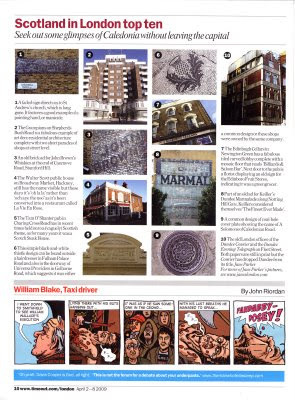 ), an interview with Wussel Bwand and a collage of articles about why London is brilliant (it just is!). And Richard Cudlip aka the cabbies capital, who I have met through our postings for Londonist, has managed to get his name in the masthead at the beginning of the Big Smoke section as an associate editor... he's put together some pieces about his observations as viewed from his black cab. Well done him! My last article for Time Out was about closed pubs. Great to see you in Time Out again, Jane. This was the best issue for a long time, with Richard there too. Bloggers rule!